I just love my big ol knitting bag. It's soft and colorful and keeps my current knitting project in a nice clean spot. This bag wasn't a planned knitting project either. I had originally started knitting a bunch of big squares and I was just going to sew them all together for a blanket. But, well....I just lost interest. My heart wasn't in it, so I just tucked away all the squares I made and left them. One day though as I was going through all my UFO's (unfinished objects) my yellow squares shouted at me. Hey! Sew me up and make me a big ol knitting bag. What are you thinking? A nice touch of sunny color and I'm lying here doing nothing! So I did. Ha ha OK I haven't lost my mind but honestly sometimes I start what I think is a great project only to lose interest in it and tuck it away. Do you ever do that? Or you just lose interest in your great knitting idea? OK so that's my rant for the day. And you've seen another side of me today with this post. So this big ol' knitting bag pattern is one that I had to remake into a pattern for you. But the nice thing is it's a super easy fun knitting project. I just love knitting garter stitch. And it makes a nice cozy, squishy fabric. The big ol knitting bag is two big knit squares in garter stitch and I added a gusset so that it would be even bigger. For those of you who don't know exactly what a gusset is, it's just an extra piece of fabric going down the sides of the bag. Rather than just sew the squares together I added sides to it so it would be bigger. Needles: 10 (6.00 mm) or 11 (8.00 mm) will work. But you can experiment. Which ones are more comfortable in your hands. Pattern Notes: I used two balls of worsted weight yarn holding 2 strands together in order to get the thickness I wanted. However it may be easier for beginners to use the super bulky yarn and just use one strand. It will be easier for you that way and you don't have to worry about holding 2 strands in your hand. The gusset was made in one long fat strip and then sewn onto the squares and along the bottom. This makes the big ol knitting bag nice and big. You can make these squares any size you like by increasing or decreasing the amount of stitches you use. Feel free to experiment. And use whatever size knitting needle you like as well. Remember that if you use a smaller size needle your knitting will be thicker and the bigger your needles are the thinner the fabric will be. Have fun with it. Cast on 18 sts and knit for approximately 36 inches. Bind off loosely. Cast on 8 - 12 sts. depending how wide you want your handles to be and knit for approximately 12 inches. You can make the handles any length you wish. Just remember that the wonderful garter stitch does stretch. Sew squares to the gusset. For the handles, seam one end of the handle to one end of square and the other end of handle to the other end of square. Repeat for the other side. Do I have to line my knitting bag? You don't have to line your knitting bag if you don't want. It is a matter of preference and also depends what you'll be using your knitted bag for. For instance if it's for knitting yarns you certainly won't have to line it. 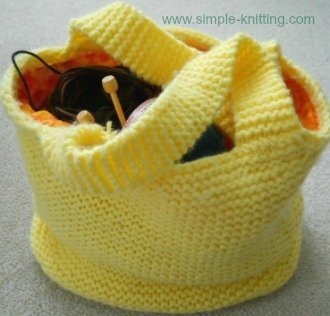 Pick out a fabric and sew together an exact copy of your knitting bag making sure that it is ever so slightly smaller. This way it will fit into your knitted bag. Next, place the lining into your bag and tack down the bottom of the fabric to the corners of the bag and along the side seams. Finish by whip stitching all around the top edge of your bag. I always place the fabric lining about a 1/4" lower than the top edge. Now you're all finished. I really hope you enjoy your big ol' knitting bag as much as I do!